This topic contains 7 replies, has 2 voices, and was last updated by Themosaurus 2 months, 1 week ago. I want to add live messenger feature in my website and also wants to add option where user can add more images in their wall. SO please let me know which plugins can help to add these 2 features in website. Hope these plugins help you achieve the features you are looking for. Thank you for your reply. All the icons used in this theme is not showing tooltip or info on hover what action they will perform. Is there any option to add tooltip so that user can know which icons will perform what task or can we change icons set? Can you please make some screenshots to show us which icons you mean? Don’t hesitate to comment or highlight your screenshots to help us better understand your issue. Please check attached screenshot for more clarification. 2. There is unfortunately no option to add an effect on hover for these icons by default. 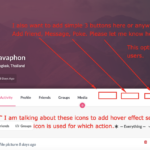 But you can choose between different icon sets provided with the theme by opening the Customizer (Appearance > Customize) and then going in the BuddyPress > Style panel. 1. Is it possible to have information, pictures, videos etc that I put on my timeline/wall all uploaded to your friends time all is well just like Facebook wall? Also inside this one group I want to make several groups so when user pay for this main group he/she can access all inside groups. Please let me know how can I do this. The topic ‘Live Messenger’ is closed to new replies.